The social media world can really be fascinating and overwhelming at the same time. Maybe it all depends on the user and how a person perceives it to be. Once in a while, a new social media platform buds out and captures the attention of everybody even if it takes another login credentials to make. Whilst some are more active than the rest, humans are known to be socially active, themselves. And that is the reason why people are always on the lookout for ways on how to stay connected with one another even with the absence of a personal interaction. Are you feeling left out? Don’t be. As this article will cover some of the top social networking sites in the world today. If we are to talk about the top social media sites in the world today, Facebook takes the number 1 spot with over 2 billion users and has a 13 percent increase every year. I’m sure everyone is aware that Facebook was initially intended for college students to get connected with each other. And now, everybody can use it. Although the site’s network and scope expanded, it still serves the same purpose. With Facebook, you can upload photos and videos for public consumption or just leave the privacy setting between your approved friends. At the same time, Facebook has an in-app page manager option for those who wish to use the site for business purposes. Still, from the business side of it, the site allows you to promote your brand, business, and products by taking advantage of the paid Facebook ads. Being said that, just recently Facebook dropped its share for almost 7% taking at least $36bn off the company’s valuation. This was due to the incident that the site was believed to work with and allow third-party companies to access over 80 million users’ data. Hence, #deletefacebook started and users start to move to other alternatives apart from Facebook. Twitter, which came out in 2006, is known to be an online news portal. If you are always on the lookout for what’s updated in the news world – may it be in politics or from celebrity lives, Twitter is the place to be. Its name already provides its definition – a short bust of nonconsensual information. Users of this social media platform interact with other users by sending out messages called “tweets”. Tweets were used to be limited to only 140 characters, but now it was doubled for all languages, with the exception of Japanese, Korean and Chinese. Gone are the days that WhatsApp is only a messaging tool which replaces the regular SMS text service. Ever since Facebook acquired its legal rights in 2014, users may have noticed the addition of another tab which lets people update their status regularly by posting photos which will, later on, disappear after 24 hours. You do not only get to send photos or screenshots from this app, it lets you edit them within the app too by drawing on the photo itself or even lets you create a GIF. What’s good about this service is that, as long as you’re connected either to a Wi-Fi or uses your own mobile data, messages and calls are done for free. May it be professionals who aspire to broaden their network or fresh graduates who are planning to land their first job – LinkedIn caters them all. The home feed would include tips talking about careers or employers who are in search for their next successful applicants. The user’s profile window is designed to look professional and smart. You have an option to post past work experiences in a nutshell or give out a detailed information, it all depends on you. Think of it as your own digital resume. Following Facebook, it is Instagram that takes the number 2 spot as the most popular social networking site. If you are an aspiring photographer, Instagram lets you brag about your shots for free. And if you’re the one who doesn’t have the patience to start up a website yet, this could be a great first step. When people want to document what they’ve been doing for the day, Instagram stories is the first thing they could think of. It works well for fashion bloggers & influencers because it allows them to create a more personal interaction with their followers or readers. Instagram’s business profile allows users who wish to market their own venture here too, and at the same time give out real-time insights on each post you do. Its growing popularity made the brains behind this social media app decide to make the platform available not just for IOS devices, but also for Android phones too. One of the features of Snapchat which made it to the popular scene in no time was the ability to post “snaps” and just make it available within the next 24 hours. After which, it will then disappear from the feed. Another thing is the different filters it provides which makes kids and even adults enjoy. Just like any other social networking sites, it continues to evolve from just a simple person-to-person photo sharing to featuring different brands showcase their short videos for entertainment. Pinterest is basically a simple mobile app that opens the doors for information to be more accessible to people. It uses images and GIF or videos on a shorter scale which works as a hyperlink to a further detailed information from the World Wide Web. This app could be helpful if a user does not have the patience to read lengthy articles at first glance. You can just easily type in a keyword from the search button, and the app will provide several recommendations which you can also save later for future use. If you are to travel to China, you have to know beforehand that Facebook is banned from the country. They even have their own mode of the communication platform, and that is WeChat. Just like WhatsApp, it allows the user to communicate with other users for free as long as connected to a Wi-Fi or mobile internet. It has its own set of GIF, emoticons too. For people who love to take artsy photos with artsy captions too, Tumblr is the place to be. It serves as a basic platform for aspiring bloggers, without the stress of managing a website regularly. Skype is maybe one of the most common apps that people use when it comes to communicating, other than sending messages or voice calls. Being owned by Microsoft, this app is readily accessible for either desktop or mobile users. It is widely used because of its voice call feature that lets a user virtually talk to another user, through a webcam, from different parts of the globe. It also allows several users to be in a single video call too. And what’s best about it is again, it’s free as long as there’s an internet connection. 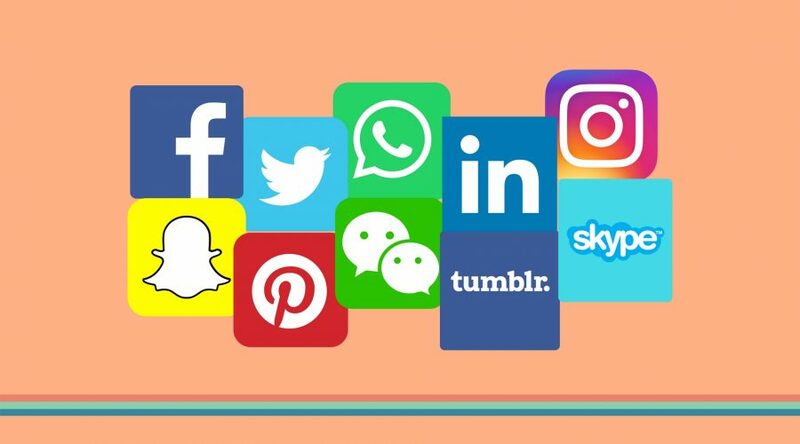 Social media sites were developed mainly for one thing, and that is to stay connected. The world has become a more open place to live in because communication can easily be accessed with just a single click of our fingertip. As these networking apps try to keep up with the user’s needs, it is our part to be responsible users in return.